The Ozeri WeightMaster 400 lbs Digital Bath Scale with BMI and Weight Differential Detection was designed and engineered in the USA to provide a comprehensive yet simple weight management solution to measure and track your weight. Featuring BMI Measurement and Auto Recognition Technology, the Ozeri WeightMaster weighs up to 400 lbs and displays your BMI (Body Mass Index), a measure of your body fat based on your height and weight. Immediately after displaying your weight and BMI, the scale's Weight Differential Detection displays your "net weight change" from your last weigh-in (L1), the average of your last 3 weigh-ins (L3), and last 7 weigh-ins (L7). By measuring your weight once a day, the Ozeri WeightMaster empowers you to see how your current weight changes day to day, from the last 3 days, and over the previous week. 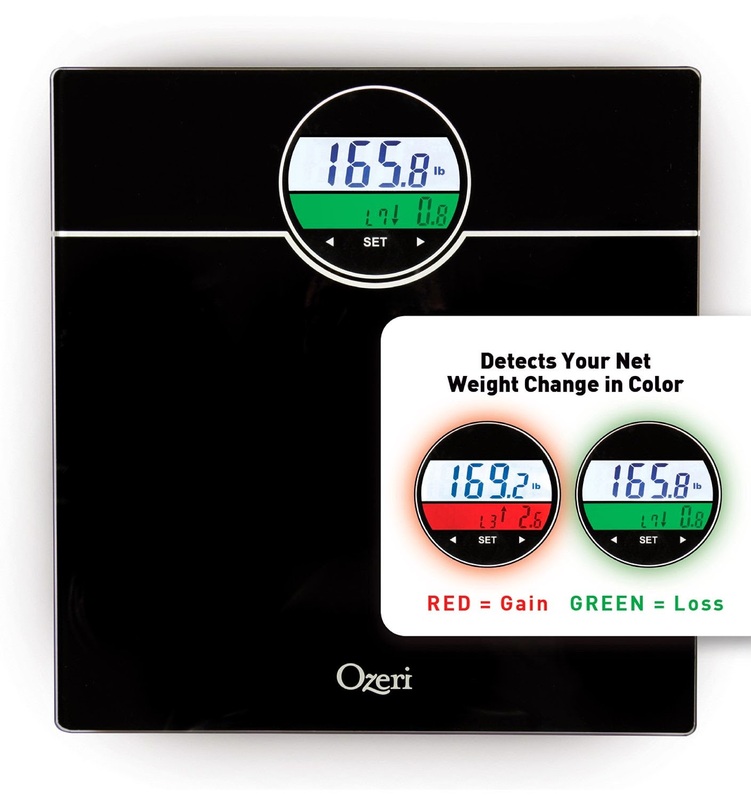 For users who would rather just focus on their weight trend without worrying so much about the actual numbers, the WeightMaster features Color Alert Technology, which displays your weight change in a GREEN illumination for weight loss and RED for weight gain, providing a visual form of intuitive feedback. With built-in intelligence, the WeightMaster requires no complicated synching and spares you the data connection failures common to more expensive wireless and Bluetooth alternatives. Precision engineered and durably made, WeightMaster auto-calibrates with StepOn technology and auto-powers off to preserve battery life. The Ozeri WeightMaster is made out of impact-resistant tempered glass, and equipped with non-slip scratch-resistant feet that won't damage flooring. Ships with batteries included, and backed by Ozeri's 100% Hassle-Free Satisfaction Guarantee. Yes, I have reviewed a couple of Ozeri scales and like the last one this scale is fantastic and keeping records of your weigh in to help you focus on your goals. It feels rotten when the color turns red and you have gained weight. The scale also gives you the BMI number which is a great addition to a scale. We wall want to have a healthy BMI! Overall the scale is nice looking and has extra features that many scales don't provide.